Edward Snyder, Dean of the newly renamed University of Chicago Booth School of Business (left to right), celebrates with Professor Eugene Fama, alumnus and donor David Booth, who has given a $300 million gift to the business school, and President Zimmer at Thursday’s announcement in the Winter Garden. Booth, who was Fama’s research assistant, credits Fama’s ideas as providing a foundation for the business strategies that made him successful. The University, a legendary professor and a set of foundational ideas launched David Booth on a path as an entrepreneur and visionary marketer. Now, after building the successful investment firm Dimensional Fund Advisors on finance principles he learned at the Graduate School of Business, Booth (M.B.A.,’71), his wife Suzanne and their family have made the largest donation in the University’s history and the largest gift to any business school in the world. The combination of an up-front payment, the income stream and the equity interest provided by the Booth gift is valued at $300 million. In recognition of the gift, the school will be renamed the University of Chicago Booth School of Business. “It’s not a gift. The University of Chicago has been my partner all along,” Booth told an exuberant crowd of hundreds packed into the Winter Garden on Thursday. “It’s the University of Chicago getting its due for helping me out all along the way.” Students, faculty, alumni and trustees gave Booth numerous standing ovations during the historic announcement. 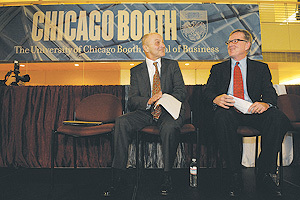 Eugene Fama, the Robert R. McCormick Distinguished Service Professor in Finance, joined Booth on stage, along with President Zimmer and Edward Snyder, Dean of the business school. Fama taught Booth’s first University course, and Booth was a Ph.D. student at the business school and Fama’s research assistant. “I remember Professor Fama standing up the first day of class and saying, ‘This is the most practical course you will ever take,’ and it turned out to be true,” Booth said. “We built Dimensional Fund Advisors around his set of ideas. I am hoping that others will join me in giving back to this amazing business school. Dean Snyder and his colleagues will need tremendous resources to realize their vision of maintaining and enhancing Chicago’s influence on business and markets.” Fama is the founder of the efficient markets hypothesis, which says investors in stocks should not be able to beat the market since there is no way for them to know something about a stock that is not already reflected in its price. Instead, market efficiency suggests investors are better off buying and holding widely diversified portfolios—the basic thinking behind index funds. David Booth addresses business school students, alumni, staff members and University officers and trustees in the Winter Garden at the Charles M. Harper Center. 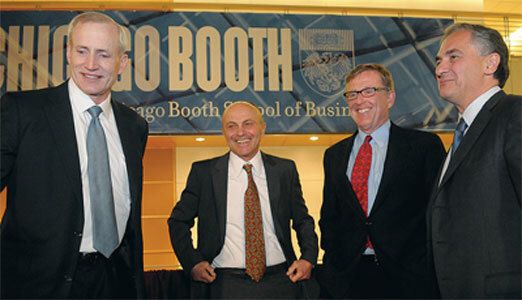 Booth, who shared some stories about his time at Chicago, noted that many of the ideas he utilized in his business, Dimensional Fund Advisors, came out of what he had learned from Eugene Fama, the Robert R. McCormick Distinguished Service Professor. The Graduate School of Business will be renamed the University of Chicago Booth School of Business. 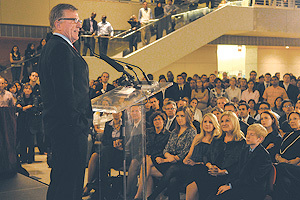 Fama and Booth share a moment during the announcement (above), as the new name was revealed. 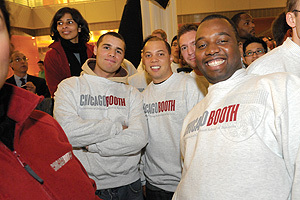 Students proudly wear their new University of Chicago Booth School of Business casual attire. Fama said Booth’s generous gift presents the school with an “incredible challenge.” David has said to us he thinks we’ve done great things in the past, and he wants to give us the means to do great things in the future,” Fama said. “The challenge to us is to deliver on that.” President Zimmer called the gift a vivid illustration of the power of ideas. “This gift provides our school with a perfectly timed opportunity to move aggressively forward, ensuring that we continue to attract the best faculty in the world,” said Snyder, who is the George Pratt Shultz Professor of Economics. When he was a student in the business school, Booth decided that rather than return to his native Kansas for an academic career, he would apply his training to the real world. After founding Dimensional Fund Advisors in 1981 with University of Chicago classmate Rex Sinquefield (M.B.A.,’72, Booth leveraged his Chicago education and the ongoing flow of ideas from its business school to develop strategies for his firm that were grounded in the efficient markets hypothesis. Dimensional Fund Advisors now manages $120 billion for institutional investors and clients of registered financial advisors. The firm has U.S. offices in Austin, Chicago and Santa Monica, and international offices in London, Sydney and Vancouver. Dimensional Fund Advisors relies on Fama as well as other University business school faculty to provide thought leadership to the firm. George Constantinides, the Leo Melamed Professor of Finance; John Gould, the Steven G. Rothmeier Professor and Distinguished Service Professor of Economics; and Abbie Smith, the Boris and Irene Stern Professor of Accounting, are members of a DFA advisory board. “By using the efficient markets hypothesis developed at the University of Chicago business school, we have been able to document clearly that you don’t have to try to outguess the market in order to have a good investment experience,” Booth said. “It would be hard to find anyone who benefited more from a University of Chicago education and from the faculty at Chicago than I have,” said Booth, who has been a member of the Council on the Graduate School of Business since 1999 and a member of the University Board of Trustees since 2002. “I believe the quality of a business school’s faculty will determine the quality of a business school over the long run. The school is already in a strong position. This gift is intended to help it keep moving forward.” The school plans to use the money for several new initiatives, including aggressively attracting and retaining star faculty. Other uses being considered include developing new faculty groups in academic areas not normally associated with business schools, expanding existing research centers, and launching ambitious programs to better leverage the school’s intellectual capital. The gift also may be used to expand the school’s international presence beyond its existing campuses in London and Singapore. Booth earlier gave the University business school $10 million to help fund construction of the Charles M. Harper Center. His latest gift, from the Booth Family Trust, represents an economic interest in a portion of the trust’s shares in Dimensional Holdings, Inc., parent company of Dimensional Fund Advisors. The business school will receive an income stream from the shares and the terminal value of the shares if they are sold. Before Booth’s gift, the largest gift to a business school was $105 million, given to Stanford University’s Graduate School of Business in 2006 by Philip Knight, founder and chairman of Nike. Other large gifts to business schools include $100 million to the University of Michigan in 2004 from Stephen Ross, $85 million to the University of Wisconsin, Madison in 2007 from a combined partnership of 13 alumni, and $60 million to the Darden School at the University of Virginia from Frank Batten Sr., retired chairman and chief executive of Landmark Communications. The previous largest gift to the University was $100 million from an anonymous donor in 2007. The funds were designated for undergraduate student aid. The Pritzker School of Medicine was named in 1968, and the Public Policy Studies was named in 1990.